Bold Patterned Wallpaper: Would You Dare? Would you consider bold patterned wallpaper for your home? Wallpaper is still on my wish list, and I’ve been on the lookout for patterns and colors that could potentially work somewhere in our house. Most of our rooms are neutral with touches of color, so going bold or graphic in a definite color would mean stepping way out of my box. To be honest, part of the reason I enjoy being a designer is working with clients who are ready for a change and want to go with something that’s a little more daring. Thankfully, those chances we’ve taken so far (sometimes with our fingers and toes crossed) have paid off. Perhaps it’s just because Valentine’s Day is just around the corner, but I’m really drawn to pink at the moment. I love this graphic Grata wallpaper design from York Wallcoverings. If I had a dressing room or my own walk-in closet, this is a wallpaper I would definitely consider. 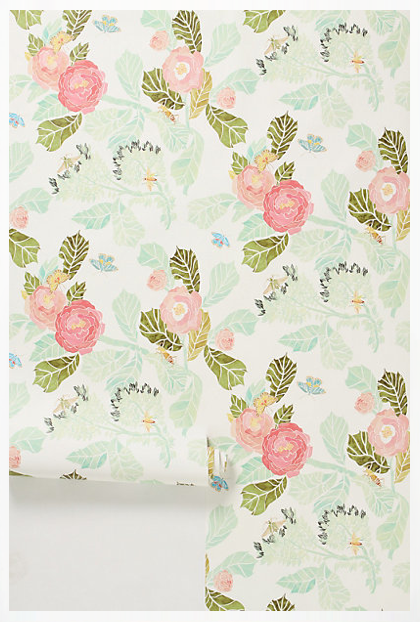 Look how pretty and spring-like this watercolor peony wallpaper is from Anthropologie! I could see this in a powder room with white-painted wainscoting below or on the back of a bookcase or cabinet for a touch of color. 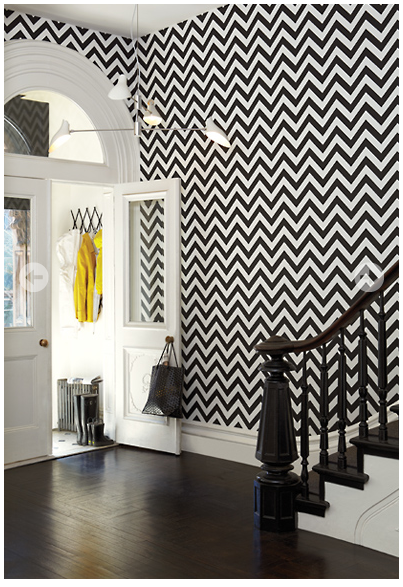 This black and white chevron patterned wallpaper by Schumacher is definitely a statement and sets the tone for the rest of the house. It doesn’t surprise me that it’s part of the Martyn Lawrence Bullard collection, a designer who is known for his bold interiors. This would take some serious commitment, but I’d love to visit this space now and again. You? Farrow and Ball released 4 new wallpaper patterns for 2014. My favorite is chromatic stripe, which is a classic multi-colored vertical stripe. These wallpapers are created on high quality paper that has been hand-brushed with paint prior to the pattern being applied (in paint as well). As a result, each pattern has a unique textural quality that I truly appreciate. I love the bold turquoise found in this color way. Galbraith and Paul’s Lotus wallpaper is printed in studio, resulting in a hand-blocked artisanal quality. 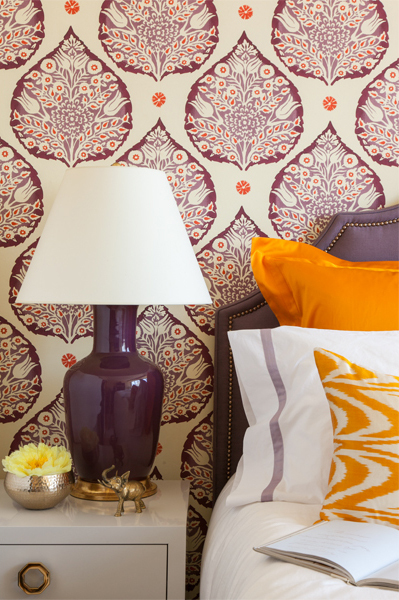 I adore the richness of this plum and orange combination that feels fresh with it’s light background. 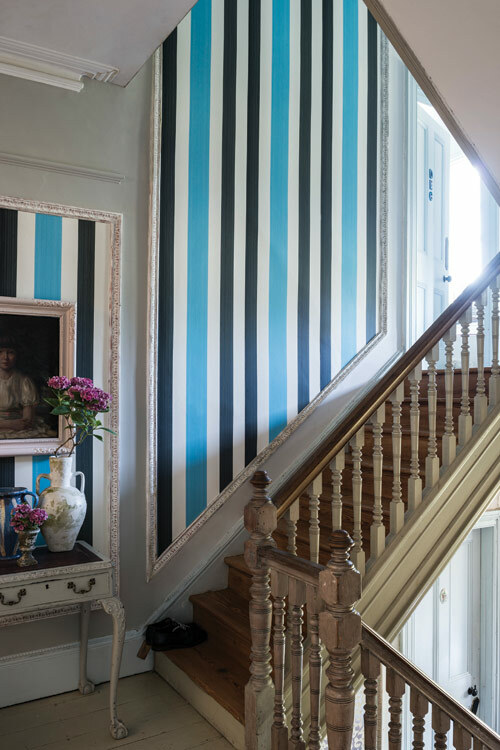 Would you be daring enough to try a bold patterned wallpaper like one of these? Have a favorite of the bunch? *Note- some of these wallpapers are available to the trade only. Please contact me if you are interested in finding out more. As well, purchasing some of these items through links in this post may mean I’ll earn a small commission at no extra cost to you. I just love that turquoise striped wallpaper. Thanks for sharing! Oh, I love these bold prints! The trellis is my favourite. I hope to use a big bold wallpaper print in a room eventually … it’s been on my I Want To Do list for a long time. I’ve been back and forth on whether or not to use one in our powder room. I think that’s probably the safest bet for me. Maybe we need to take the leap together! Shauna, I’d say the powder room is your best bet! As a Home Stager I advise against wallpaper since it is so taste specific and what you like is not necessarily what a potential buyer will like.. But having said that, if you are not planning on moving in the next 3 years, take the leap and enjoy it!! Definitely something to consider. We do plan on selling within the next few years. I’d definitely dare and have and love it! And yes, I did it in my powder room and everyone comments on it and loves it. The great thing is once you are tired of it, it’s an easy thing to change with today’s wallpapers. I would do bold wallpaper but I wouldn’t do flowers or pastels. Even though I love both. Just not on my wall. Together. I hope that you’re enjoying the winter. This is something I’ve been toying with – it was nice to see a examples. The red and white one is my favorite. I decided after having wallpaper in our first house, that I would not be having it again. It was too labor intensive when it had to be removed and it limited how we decorated. Now that we’re in an apartment, we can’t have it . I do like how pretty it looks though. If I had an older home, I could definitely see the black chevron in my home. The only wallpaper we had was in our first home in the downstairs powder room. Have a wonderful weekend!